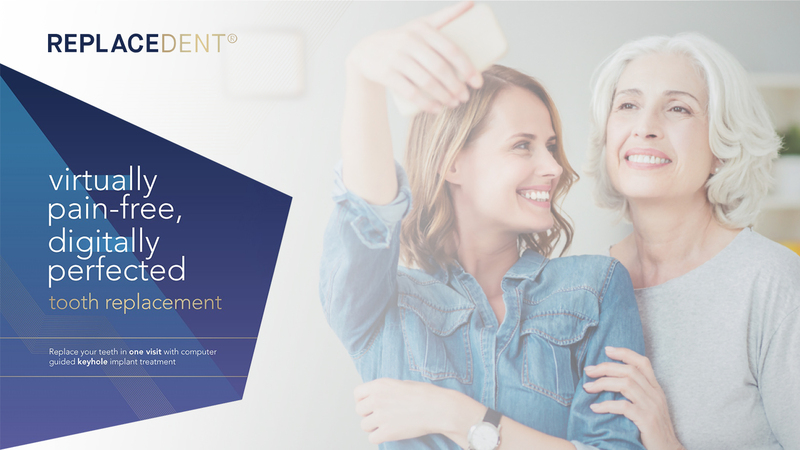 Taking the distress out of tooth loss and restoring your perfect smile, the REPLACEDENT® system has revolutionised tooth replacement in the digital age with the aid of computer guided software and 3D printed keyhole technology. The result is predictable, precise and permanent replacement of your teeth with dental implants in an almost pain-free procedure. If you have been waiting for an atraumatic solution to replace your missing teeth and get on with your life and your new smile the very same day, congratulations – you need not wait any longer. Whether you are missing one tooth or a full arch of teeth, with the precision of our computer guided implant planning and placement, we are able to 3D print or mill your tooth, crowns or bridges in advance so that they can be inserted at the time of or soon after implant placement. Meaning your new teeth and best smile can be achieved in one appointment in suitable cases. Your new teeth with completely natural look and function can start here today with a diagnostic scan. With the world leading computer guided technology, your best smile has never been more attainable. I’ve lost a tooth because….what can I replace it with? With the rapid advances in technology, replacing individual or multiple missing teeth has become an affordable and realistic option that can be performed by our highly trained Dental Surgeons in-house. An Implant is an artificial version of a tooth root that is surgically placed in the jaw to support a false tooth or teeth. They mimic as closely as possible a natural tooth or teeth; by providing function, aesthetics, preventing adjacent tooth movement, further bone loss and obscuring unsightly spaces caused by the loss of a natural tooth. Replacing lost teeth with Implants has many benefits over traditional fixed or removable appliances such as Crown and Bridge work or Dentures, as they only involve the space left behind from a missing tooth. They are highly conservative, sparing surrounding healthy teeth from unnecessary interference and tooth structure loss. They are designed to withstand greater biting forces, integrating into the natural jawbone preventing bone loss and collapse of the facial arches and soft tissues. Implants have a natural appearance that can be relied upon to function just like a normal tooth and most importantly give you the confidence to smile, speak and eat without fear of mishap. It is never too late to ask whether an Implant is possible for you – for one tooth or for large areas of tooth loss including full arches, reducing the need to consider less functional options such as dentures. Implants are an option for anyone who has experienced tooth loss but like all dental procedures, they do require consultation and special planning, to assess the suitability of the area and your specific requirements. Hopkins Dental has invested in the latest 3D technology to scan the jaws and visualise the potential implantation site, combined with the expertise of the surgeon and the best the world has to offer in Implants, to ensure you get the best possible results. From the initial consultation to the final Crown restoration of the Implant, your Dental Surgeon will monitor and aid you in the care of your original dentition and the Implant whilst healing and beyond. 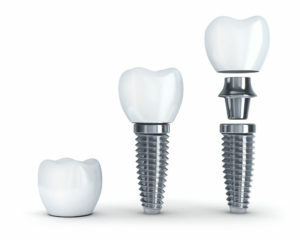 The Implant process does take time, several months in fact, which begins with Consultation and Treatment planning – utilising the Orthophos XG-3D CBT/OPG Dental Imaging System, the taking of Impressions/Models of the dentition, Quotation of all facets of the treatment, and most importantly Questions and queries. Stage Three – Insertion of Crowns and care instructions with 6 monthly reviews at general check-ups. If you are interested in what Hopkins Dental can offer, contact us by phone or email and please click the link to gain an overview of the Implant Process.